Recorded at Simon's recording studio, County Clare, by Simon O'Reilly. Mixed at Black Box in France by David Odlum. Mastered at Marcussen Mastering, Los Angeles by Louie Teran. Artwork coordinated by Turlough Rynne at Point Blank Media. 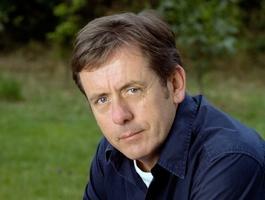 All photographs taken by Luka Bloom. Eamon O'Reilly, BJ Cole and Guy Jackson. ground as human beings, we will communicate on a basic level." Thus spoke the Dalai Lama. These words are a good way to describe how I feel about this new record TRIBE, and especially the title track. In Autumn 2005, I was sent a copy of Tide Lines, an album of original instrumental music composed and recorded by Simon O'Reilly. It's a lovely record, but I immediately was intrigued with the possibility that Simon and I might do some work together. I visited Simon's studio in County Clare, and we hit it off. So over the next months Simon created music and sounds, and posted them to me to my home in Kildare. Not once did we sit and play together. I listened to Simon's sounds and created lyrics and vocal melodies based on his music. After about 6 months, we felt we had enough material to make a record. At this point, I invited David Odlum to mix the record and record the vocals. David has recorded The Frames and Gemma Hayes and many others for years. He works in Black Box, a remarkable rural studio in France. The result is TRIBE, a unique project in my working life. I play guitar on only 2 tracks. Simon produced and co-wrote the record with me; and we also have some lovely guest performers, including a recording debut of my son Robbie, who does a cool backing vocal on the title track! 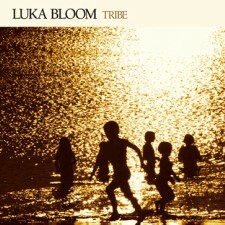 ...Luka Bloom has constantly changed his persona and continues to do so on his new album 'Tribe' - written in tandem with Dubliner, Simon O'Reilly - suggesting something new musically whilst further investigating his well known political beliefs. With its suggestion of both ambient and film music, the new album could perhaps be best described as introspective and subliminal in feeling - an idea with which Bloom concurs when chatting prior to his latest round of concerts from his home in Ireland. "That is an interesting way to describe it," he suggests. "It's the kind of record that I have wanted to make for years. I've always had a bit of a strange affection for pretentious music and electronically driven tunes, soundtrack music and ambient music. You know, certain kinds of work that I've always loved to listen to but which I have always wondered whether I'd have an opportunity to make such a record myself - one that dips into this area of music. You know, very removed from the life of a singer-songwriter." The collaboration with Simon O'Reilly, according to Bloom, "Came about due to my hearing an instrumental album that he had created about 18 months ago and I just loved it. I loved the textures of it. I loved the way he constructed the tracks on it. So I thought that I really wanted to meet this guy; and I went and met him and we really hit it off and decided to try to collaborate. We had one conversation about the nature of the record we wanted to make and we never spoke about it again and we never even once sat down in a room and played music together," Bloom admits. From listening to 'Tribe' I suggest to Bloom that perhaps he and O'Reilly were trying to create a whole musical landscape within each song. "Well," he laughingly replies, "that's precisely where we wanted to go, actually. Simon is a visual kind of musician and he writes a lot for film and so he was able to create these kinds of landscapes for me to work with and that is what made it really exciting for me. "So I would wait at home for the post to arrive with his music. He would send me a CD with like ten or twelve tracks every month or two and I would work away for weeks and weeks just trying to make sense of what I had been listening to - trying to find my way in. I completely created all the melodic links." In short, O'Reilly gave Bloom the mood, as it were..."Yes, it was the first time in my life where I completely handed over the responsibility for the creation of music to somebody else and there is a fair bit of trust involved in it but he's a great guy and it was really nice working with him."